One was an image of President Trump, and another was a Photoshopped meme of Fox News' Tucker Carlson. The edited image shows two bodies hanging from a tree next to the words "Day of the Rope," a far-right meme about their desire to execute journalists. Underneath Carlson, where the scrolling cable news ticker would usually appear, it reads "JUST KILL THEM. MAKE AMERICA GREAT AGAIN." Wing was one of many journalists who were let go by Buzzfeed and HuffPost this week and were sent death threats from trolls organizing their efforts on the far-right message board 4chan. Many of those targeted by the harassment campaign did not cover the far-right, including Wing, whose beat focused on inequality and guns. "It really is upsetting to see such outright animus toward the entire journalism profession, to the point where trolls are openly reveling in people's misfortune or even working to make it worse. But ultimately I think it says more about their character than anything," Wing told NBC News. "What sort of sad and pathetic human being do you have to be to do that?" Tweets sent from trolls to Wing that included everything from threats to racial slurs to images of swastikas remained visible on Twitter were still visible hours after they were posted. Buzzfeed and HuffPost both laid off substantial portions of its newsrooms this week. Buzzfeed said it would cut about 15 percent of its workforce, and layoffs began Friday. HuffPost's parent company, Verizon, promised to cut 7 percent of workers from its media division, and those layoffs began Thursday. Talia Lavin, a freelance writer whose primary income was a political column for HuffPost before her editors were laid off this week, found 4chan threads with users bragging about "taunting them with my sock puppet Twitter." "I'm gonna burn so many sock (puppet accounts), I can not help, but gloat to the max," one user wrote. Another user implored others to "hammer these [expletive] hard and tell them to learn to code." Lavin was inundated with sexist and anti-semitic slurs, including one calling her "oven-ready," and outright threats on Twitter and Instagram, both as replies to tweets and direct messages. One troll even sent a taunting message to her PayPal account. Lavin said she was able to identify the origins of the campaign because of the "uniformity of the responses," noting they all began with tweets of the same memes before using varied racial slurs and threats. She said she believes the social media companies could be more proactive in finding and taking down these accounts. "It's particularly hard to police when it comes from other sites and migrates to another platform," said Lavin. "But use of the same phrase, lots of blocks (from users) in a short amount of time—these are clues." 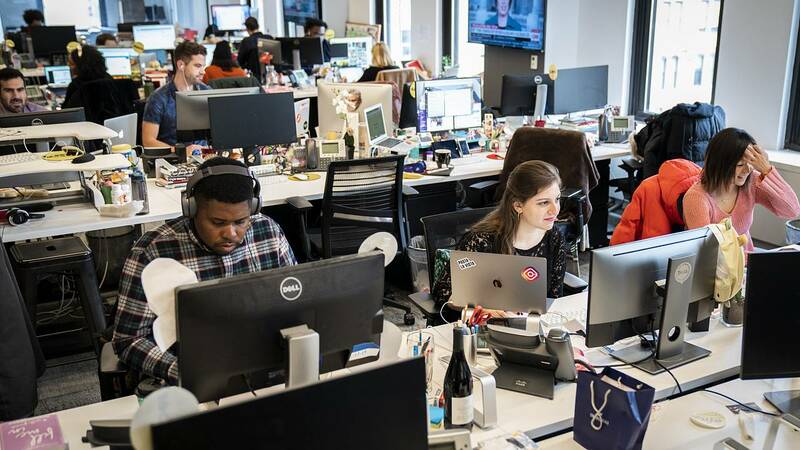 A Twitter spokesperson told NBC News it's taking steps to prevent brigading, the process of coordinating a hate campaign on one site that is later deployed on targets on another site, that are targeting journalists on its platform. "We are disheartened about the layoffs many journalists are facing right now and are working to prevent people coordinating on other services from making the situation worse. We are taking action on content that violates our rules and will continue to do so," the Twitter spokesperson said. The death threat using Carlson's Photoshopped meme that was sent to Wing, for example, remains prevalent on troll sites like 4chan and on pages hosted by social media giants like Twitter and YouTube. The image was created by an account that frequently posts images about killing journalists on Gab, a social network that attracts mostly far-right users. One YouTube video using the image as a thumbnail has over 17,000 views. Others linger in the replies of journalists' Twitter accounts. "You never know how seriously to take these sorts of things, but it's not like attacks against the press are unprecedented," Wing said. "It hasn't even been that long since a gunman killed five journalists at a Maryland newsroom. The president continues to constantly attack the media, using language that these sorts of trolls now parrot ad infinitum." "As long as the social media ecosystem continues to exist in the way it does now, it's something we're all going to have to learn how to manage in our own ways," he added.